After a devastating end to an affair with a married man, Ella quits her job and begins to work at Quentins to help out her family. She throws herself into creating a documentary of the restaurant to get over her heartbreak. We also follow Brenda and Patrick (owners of Quentins), Ella's friends, and many others who had been in contact in with the restaurant in one way or the other. The stories weave into each other in unexpected ways creating a heartwarming story. 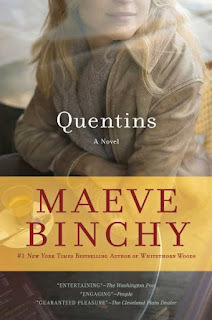 If you are a fan of Maeve Binchy, then you've already visited Quentins, which has been a backdrop in previous Maeve Binchy novels. It is very difficult for me to review this book because I don't think I can do it justice. This always happens to me with Maeve Binchy. 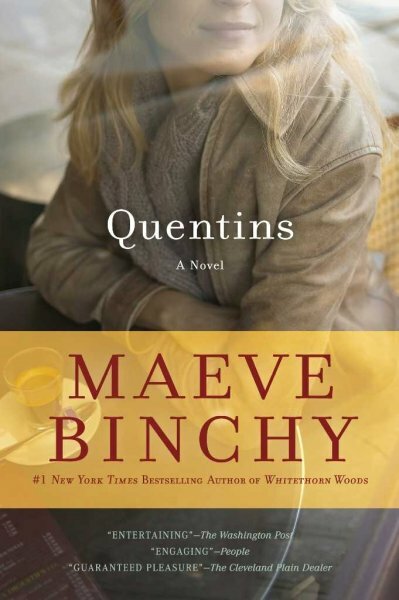 Neither the back summary or front comes close to giving you a clue to how great this book (and Maeve Binchy) is. I instantly fall in love with the characters and feel their pain and triumphs. This book does not gloss over reality and doesn't have a pat ending. However, you might shed a small tear when it is over. I use to love her books. I love the new covers they've given her books. I was just admiring the new Scarlet Feather cover.